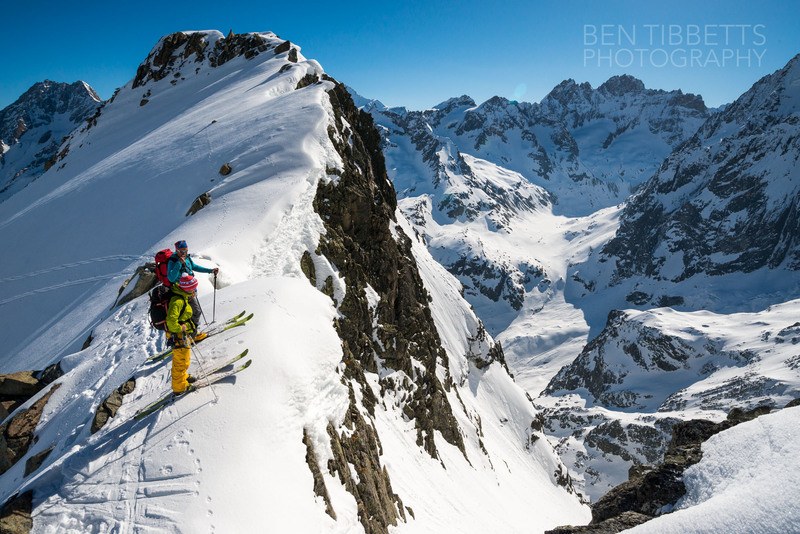 Perfect clear calm weather for a quick day hit to ski an interesting couloir in Switzerland yesterday! 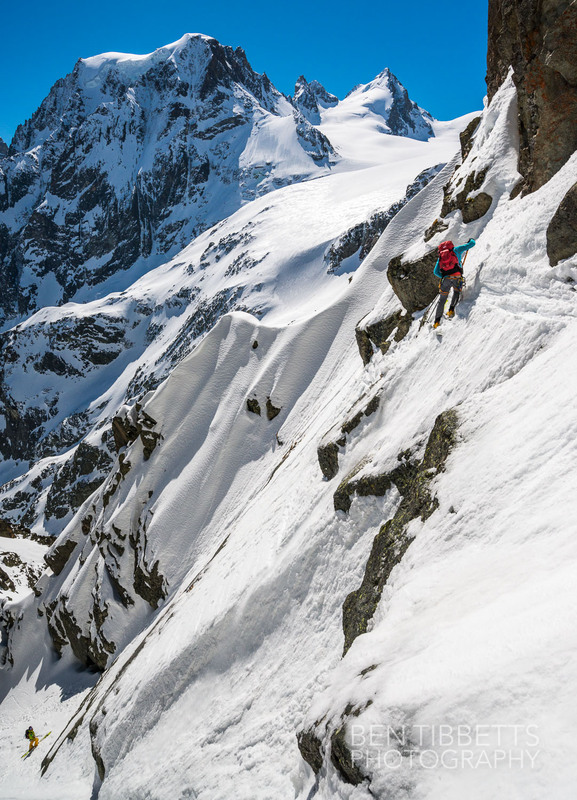 The week before I was working on the Haute Route skinning up to the Bertol hut and spotted a couloir below the Vignettes hut (near Arolla, Switerland). There is the obvious big gully below the refuge itself, but lookers right, amongst the rocks is a jagged line of snow that looked continuous. About 13 years ago on a climbing trip I remember having seen this line also and wondered if it might be a nice snow climb. Back then it wouldn’t have even crossed my mind that it was skiable! 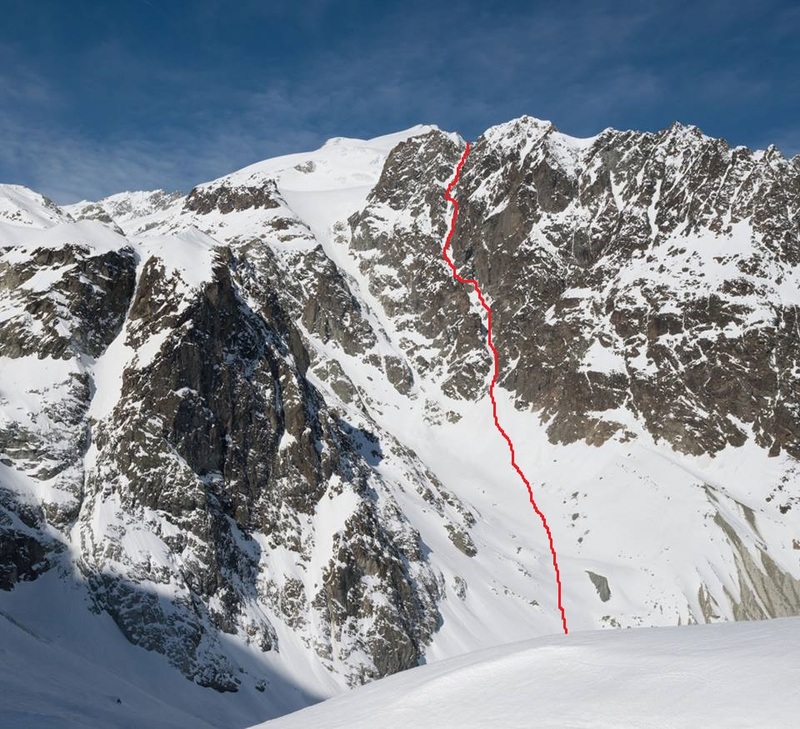 The line of the couloir. Just behind the entrance is the Vignettes hut, behind the small peak to the left. 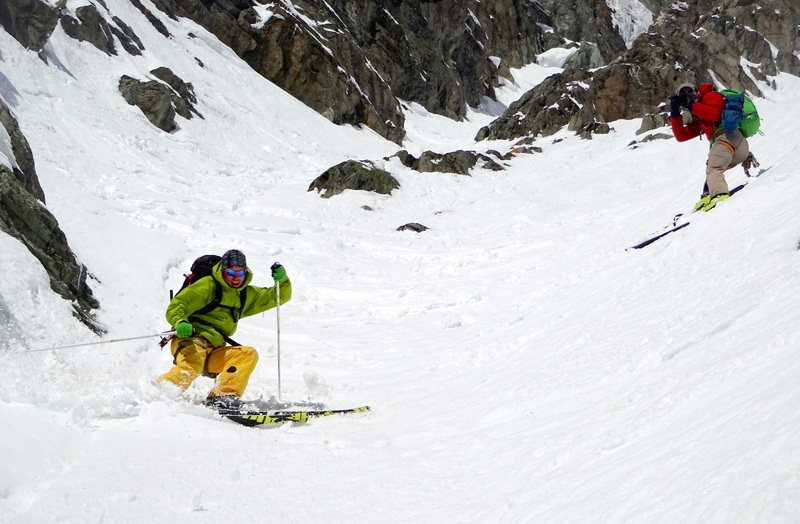 Jesper and Mikko at the couloir entrance. Jesper getting involved … 9.30 am. Mikko just above the first little icefall. The first hundred metres or so were fairly mellow and good snow for me to warm the legs up. 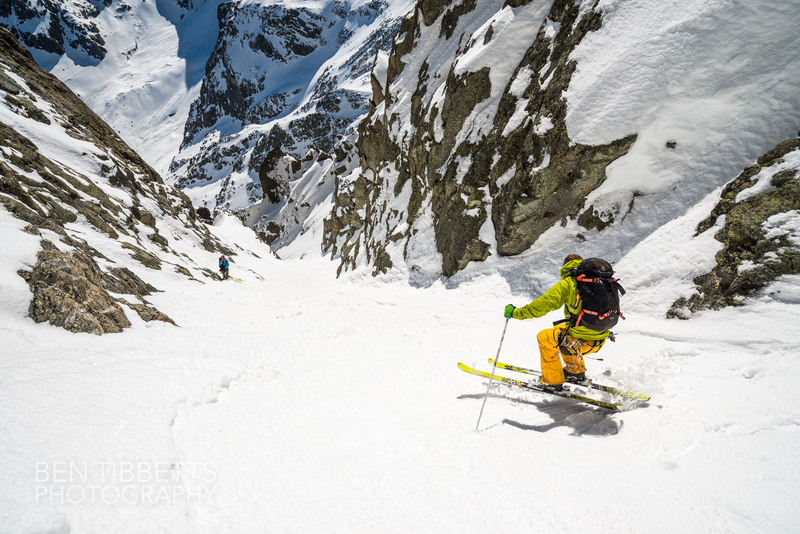 As Mikko wrote ‘Couloir was really cool, not so steep but very technical.’ … well for these guys anything less than 55º is ‘not so steep’. 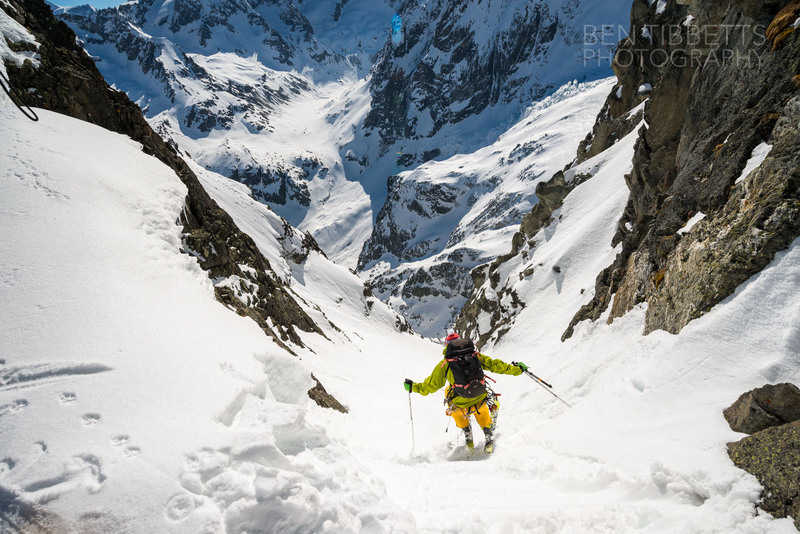 After 100 metres the couloir dipped to the left, just where Mikko is in the photo above. Straight down was a little icefall, but with a bit of sideslip and traverse across the top of it we all got past. Jesper just passed the ice which is below me. 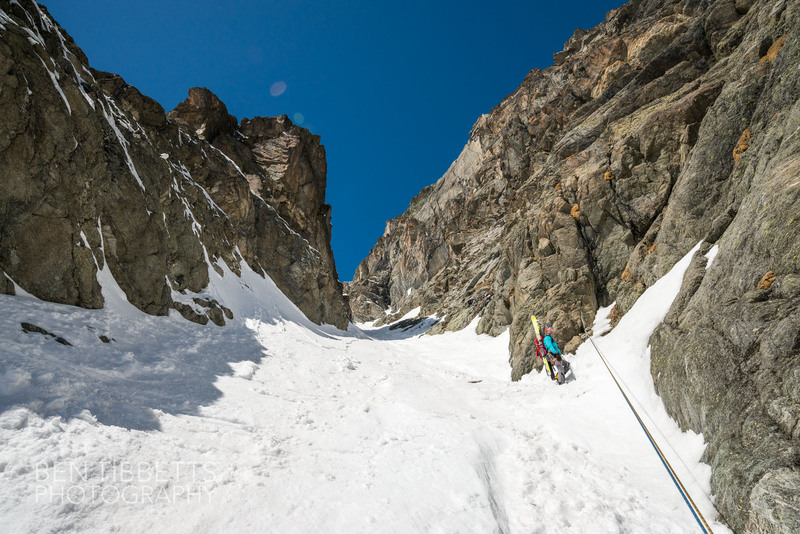 In the photo above, due to distortion of angles on the ultra-wide angle lens, it looks nearly flat… we all used axes to get along this passage! Fairly continuous steep gradient but nice snow for the next 150m. 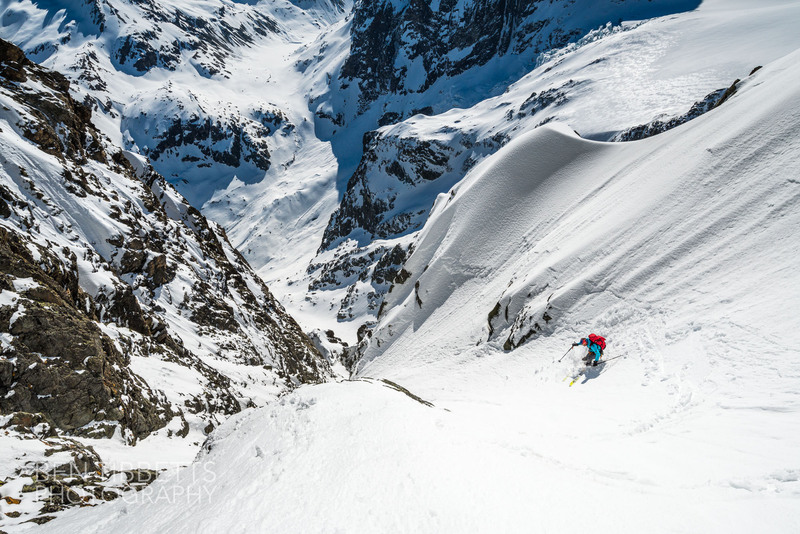 I really liked the way this couloir bends to left and right after each pitch so you never know what to expect below! 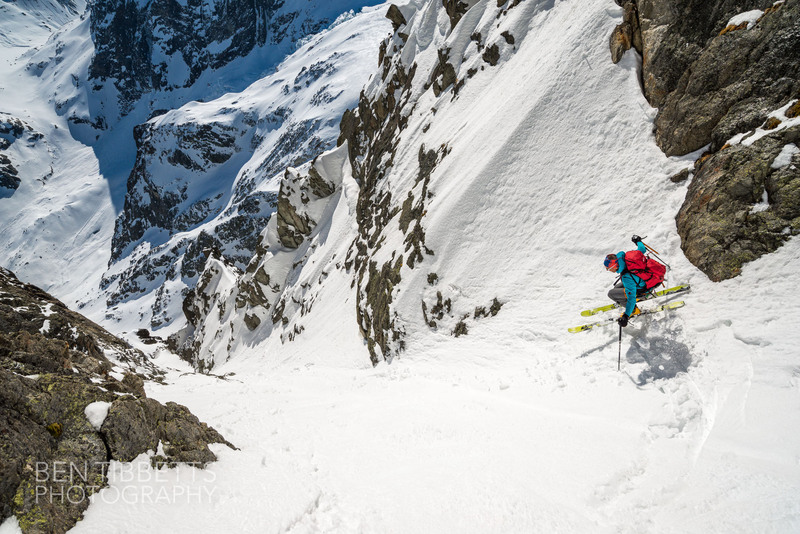 Mikko making hop turns… nice width couloir… not too tight! 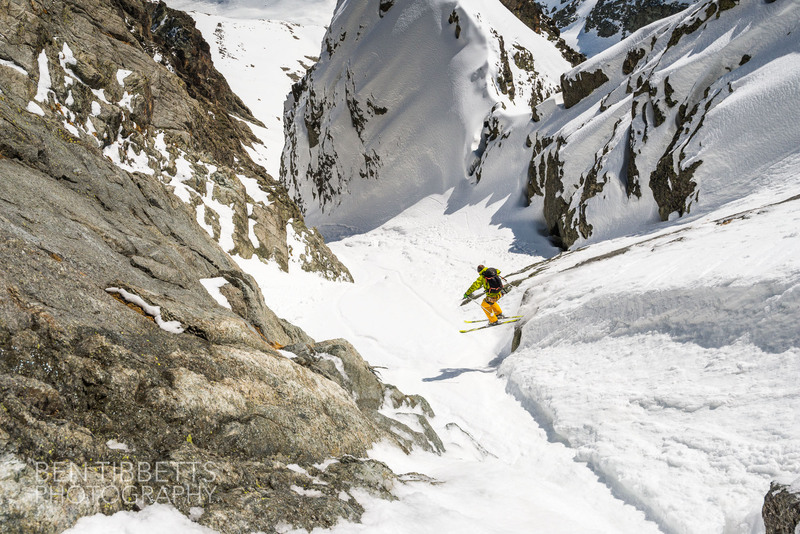 He actually hit a patch of hard snow just after this and ejected from his rear binding.. a bit scary to watch… I skied this a bit nervously after that! 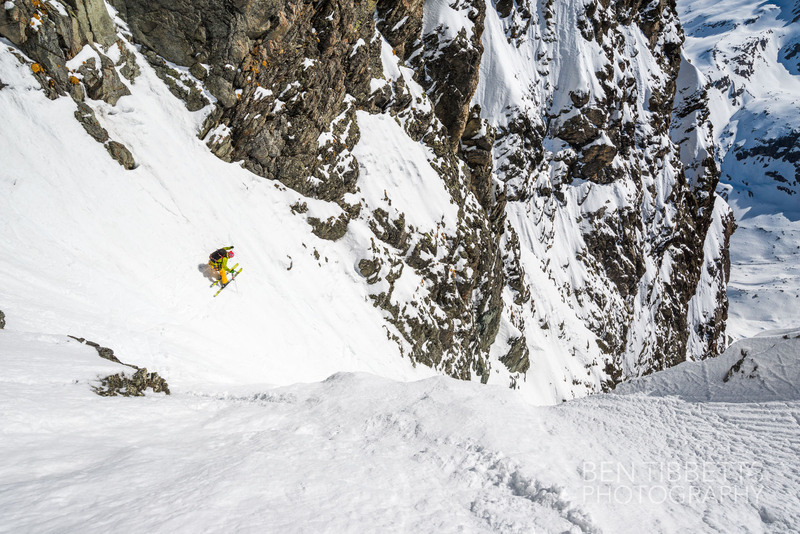 A little lower the couloir is a bit wider again… Jesper cruising. 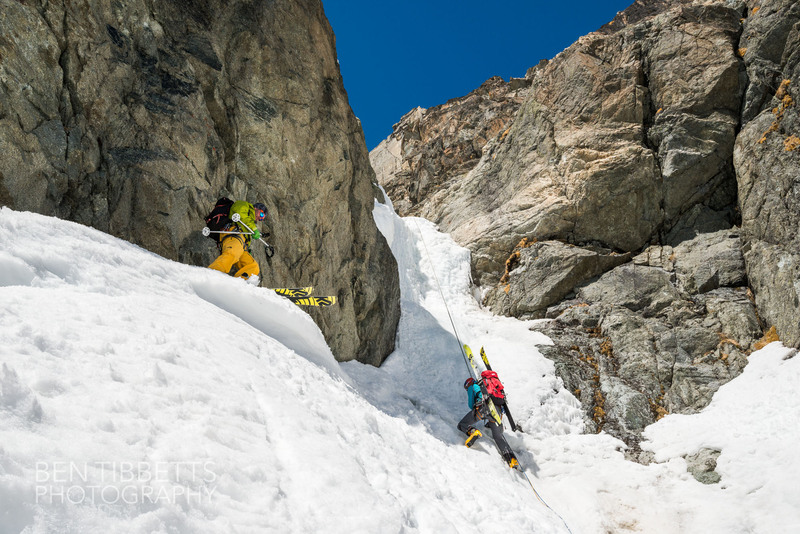 About half way down the couloir we came to a little icefall that seemed obviously like a little rappel… and to Mikko and Jesper was clearly a challenge to get by without a rappel… the guys avoided it by a delicate traverse out right on some very steep terrain! 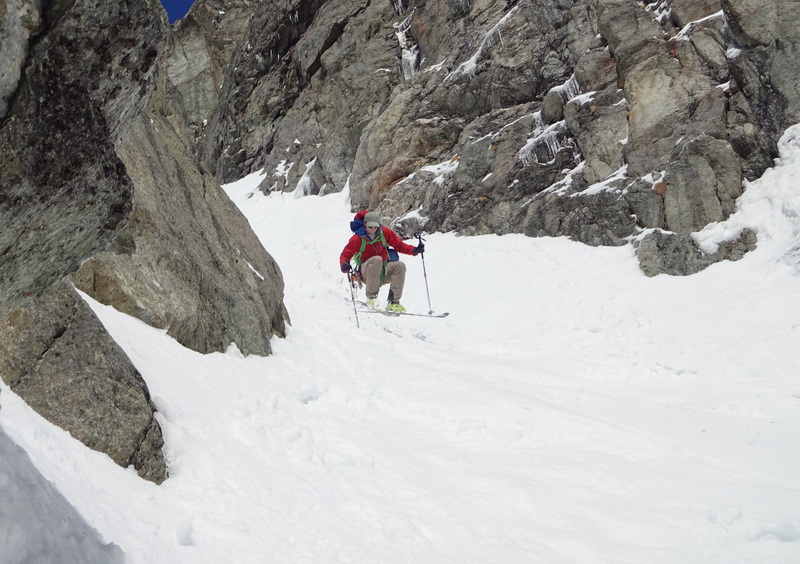 The next 200m was more mellow again, with some nice snow on the shadey side where the couloir opened out a bit. 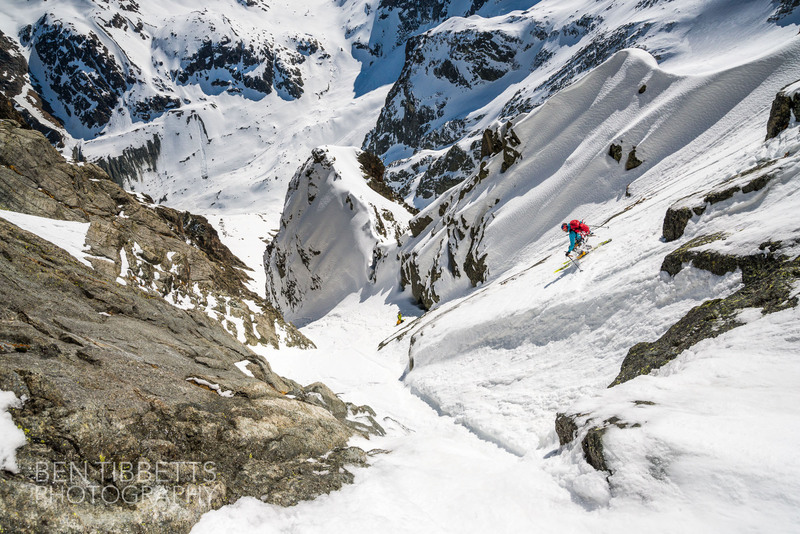 After this in the last 100m the snow surface deteriorated with icy crusts and runnels! Looking back up the couloir from the rappel at the exit. We backed up the rappel with another nut. 1 piton was in place. Mellow slopes from there took us back to the base of the valley and along the track to Arolla. I’m glad we got up early as the snow was already at the limit of rotten by the time we got down. 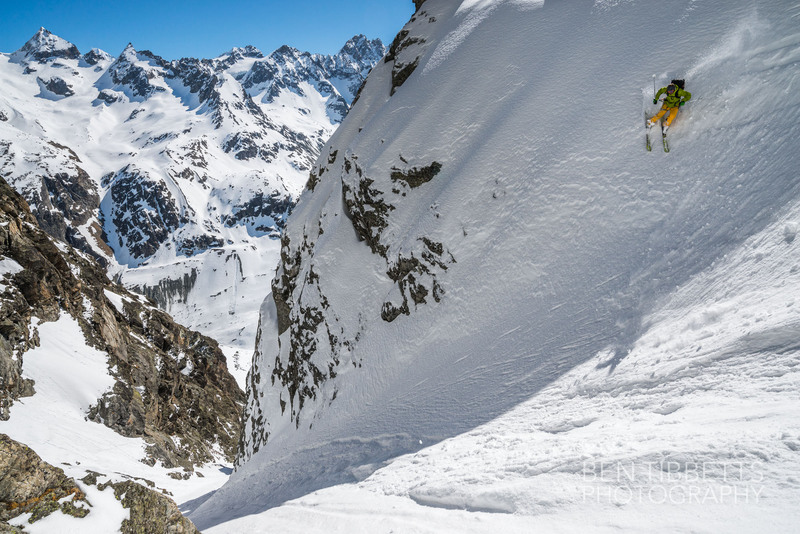 On reflection the couloir could be a nice ski in cold snow, but given how much sun it gets it would be tricky to get good conditions in midwinter. Also it clearly needs a lot of snow build up fill in the steeper sections so spring snow in april is probably as good a time as any. Best take some spare pitons and nuts and tat if you go to ski it as the rappel anchors weren’t that good without backing up. Thanks Mikko and Jesper for a great day out! 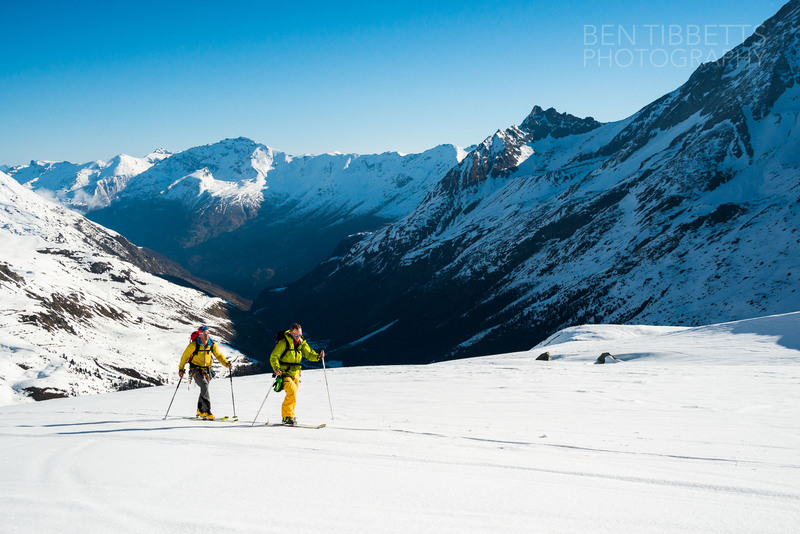 For more photography head to www.bentibbettsphotography.com !